1. 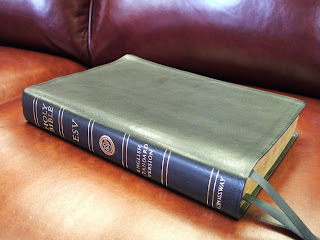 Visit www.esvonline.org. Here you'll find a user-friendly site and one of my favorite translations: the English Standard Version. 2. Enter your passage for the day. 3. Now open itunes and find your favorite post-rock band. 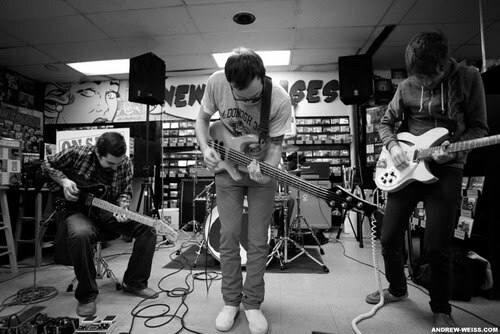 (explosions in the sky, this will destroy you, sigur ros, mogwai, etc..) Today I chose, This Will Destroy You, a delightful band from San Marcos, Texas pictured to the right. 4. Hit play in itunes. Adjust music to background levels. 6. Now sit back and enjoy or read along as scripture and music mingle together. That's it. I like this method, at least today, because it mixes auditory and visual learning as well as awakening that part of my brain that works through things creatively, hopefully employing both left and right regions of my brain simultaneously. Either way, its enjoyable. I would personally advocate for music without words. So if its Mozart or Dead Mau5 or Derek Webb's new Feedback record its great, just don't let the music get in the way of the words God has for you. Enjoy! I'm a big fan of the University of California Berkeley Veritas Forums these days. They feature some really great communicators who possess brilliant minds. Here are a couple that I've deeply enjoyed from two of my favorite Christian thinkers. Enjoy. Everybody wants to change the world, but nobody wants to die. Change is a fascinating thing. On one hand, change is always happening. Our bodies growing older, stronger, weaker, fatter. Our relationships deepening, stagnating, falling apart. It is true that change is inevitable, and yet all of us on some day or another find ourselves wishing we could change the world. Yesterday was yet another day of change in America. Republicans gained a multitude of spots in the House of Representatives. Political tides are turning yet again. In reflection I couldn't help but remember the artwork of Shepard Fairey, made famous during the campaign of our president Barack Obama. The words HOPE, PROGRESS, and CHANGE displayed neatly across the bottom of each visually striking print. After their circulation and a few speeches "Change"and Barack Obama were absolutely synonymous in the fall of 2008. And our world did change. It always does. But is change all we really want? I honestly know very few people in this world who don't want it to change on some level. Whether it comes to politics, religion, parenting, pop-culture, or the morning commute everyone wants the world to change. So the question for me is less about the whether or not the world will change or should change, and more about what the world will change into when you get, when we get our way. We all want our change, which is why we have to be so incredibly careful to know what change we're hoping for and why we hope for it. Change by itself is simply not enough. Frustration with failure and change in reaction just to see a different horizon simply won't do. We need to know what kind of world we are hoping to see at the end of that change and decide that if it costs us, that we're willing to do whatever it takes to accomplish it. This is partially why I consider myself a Christian. There is something, though often radically twisted and skewed, in the story of Christ that reminds me how I believe change works most effectively and casts a vision for what I hope for in a world changed. Jesus Christ lays down his life on behalf of the world to change the world. Sacrificing rather than Hoarding. Serving rather than imposing power. Choosing silence on the cross rather than slinging mud. Dying for Jews and Gentiles. Friends and Enemies. Both. ALL. Its through this kindness, inclusiveness, love, service and sacrifice that I personally believe the world becomes the kind of place that everyone can enjoy; experiencing the kind of change that benefits all and not only a few. The kind of change that benefits even those who don't believe its true. Some would say that the Christian record historically is pretty shot. I would agree, that at some points in history, Christians skewing the message of Christ have done some pretty awful things. But people of all faiths, including non-faiths have done so at some point or another. That's not my argument or my fight. My simple point is that I have decided that I want to change the world, but I specifically want the world to look more like the world Jesus taught us about. Not some Christianish version of that mingled endlessly with my insecurities and whimsical hopes. Jesus. It may not be the change I always want see. But I'm trusting that its the change our world desperately needs. In the past 24 hours I have had the opportunity to witness the atmospheric highs and deeply troubling lows of being a fan. Last night the Texas Rangers finished up a dominant display in the ALCS, defeating the Yankees at home in Arlington. It was one of the proudest moments of fandom of my life, watching a team I've followed since I was a kid take a another step it has never known. Then Josh Hamilton in the midst of celebration gives glory to Jesus and then proves it by praising his teammates rather than himself when awarded ALCS MVP. Then the team returned the love by celebrating with ginger ale rather than champagne in honor of their teammate. These guys seem to actually love each other. I am beyond stoked for the World Series. Today however, I attended a University of Texas game at DKR. Texas was a three touchdown favorite as they set out to demolish the Iowa State Cyclones. Now, there is no question, the game was rough. UT offense, defense and special teams all struggled throughout all four quarters and honestly Iowa State played an incredible game. Needless to say, UT went down in a very disappointing defeat and a deep groan is felt throughout all of Austin, Texas today. Here's the thing that got me though. These kids don't get paid and yet a catastrophic amount of money is made on their backs. They're nineteen and twenty years old, and yet they're expected to act as grown men, when all around them actual grown men, with real jobs, life experience, wives and children; some twenty and thirty years older than these boys are screaming obscenities at people they loved just a week ago when they were beating the stuff out of another team of young men from Nebraska. I know one of the young men I was watching today. He was in my youth group when we first came to Austin, and because of that fact some things became very real for me today. Mostly, we have bought into a lie about what it means to be a fan and we all need to grown up. Here's the deal. These people entertain us. They give us something we can't create or perform on our own. The least we could do is to be a real fan. Sure we follow teams for years, but often that's cowardly fandom, when we turn our backs on the actual team and remain loyal to the brand. Then you're just a fan of the good old days or some whimsy driven ideal. Sure teams go through good and bad years, but real fans root even when its difficult to. This doesn't mean that they're not disappointed or realistic, but you keep rooting for people if you're a fan. We all know this is bigger than sports. Friends, may we end our days of objectifying people as one characteristic, talent, performance or flaw. We are all certainly more and may we treat each others as such. The question: "Even when you feel disappointed or dismayed at the outcome or performance, can you still root for someone or a team?" I had a discussion with a friend today about the Bible and Vegetarianism. We were specifically talking about a passage in Genesis and had opposing views. It turned out that I was wrong about my initial interpretation and had to concede after some faulty reasoning that I was in fact errant. I had a similar conversation with my best friend Austin the other night when discussing the idea of constructing a Muslim Cultural Center near ground zero and the Constitutionality/Historical Christian view of the build. In similar fashion we came to the end of a heated conversation and I quietly stewed over my frustration with being wrong and then finally and quietly conceded. Like anybody else, I found myself frustrated with being wrong in both instances. I hate being wrong. Plain and simple. I despise the gnawing sensation that sits heavy in my gut when I know that I've made an argument that I can't stand behind anymore. Losing an argument can sometimes feel like losing an arm. Its painful. What is fascinating is that sometimes I never concede just choosing to hold on to my pride in spite of the fact that I and everybody else knows that I'm way out of line. I feel like I've recently learned why I act the way I do, and for that matter why so many people struggle to change, even when they know change is in order. "You know the adage 'People resist change.' It is not really true. People are not stupid. People love change when they know it is a good thing. No one gives back a winning lottery ticket. What people resist is not change per se, but loss. When change involves real or potential loss, people hold on to what they have and resist the change." Loss, not Change. Fascinating, right? So here is what I believe happens in conflict much like that which I experienced with my friends. Most of us cannot even imagine being wrong, not because being wrong means that we will have to change, but more appropriately because being wrong involves loss. Loss of rightness. Loss of an ideology that we hold dear. Potentially loss of respect. Loss of a way of life. And all of those things are difficult to endure. This is what makes change difficult. Most of us subconsciously resist change because we know that change will bring about loss. I realizing that Jesus spoke about loss and the Kingdom on a pretty frequent basis. He was incredibly up front about the change and subsequent loss people would experience if they took hold of the kingdom. If you want to save your life, you'll lose it. If you wanna come after me, you have to take up your cross and follow me. You want the kingdom, sell everything you have and come follow me. You might not have a home and don't even think of burying your dad. But there's another aspect that we must always keep in mind. On the other side of every loss is a new reality, a new cultural norm that in some circumstances is rather sad and isn't very redemptive, like losing your driver's licence when you're 80 and having to move into an assisted living home, but when it comes to Kingdom specifically it means finding life that is truly life. Maybe we need to get introspective from time to time and recognize as I have through the help of my friends, that being wrong and suffering the pain of humiliation or a loss of rightness, is actually wonderful when you get to know the truth on the other side.